The surfboards in the administration building and the Adirondack chair in front of the John Wesley statue might help close the deal for some prospective Virginia Wesleyan University students. But that’s not what struck Nicholas Hipple when he arrived for a tour nearly five years ago, thinking there was no way he wanted to follow his older brother to the 300-acre VWU campus in Virginia Beach. For Hipple, whose younger sister has joined him at VWU, the “aha moment” came as he observed how students interacted with professors in class. “The one thing I hear from students is that they like how personal the school is,” he says. Individual attention is a hallmark of small liberal-arts schools, one that remains central to Virginia Wesleyan as it evolves to meet the challenges of an increasingly competitive higher-education market. “We could sit here and allow those same factors to have a negative impact on us, or we can develop a new business model that celebrates our strengths and markets us to new constituency groups,” says Scott D. Miller, VWU’s president. In taking the job in 2015, Miller was charged with bringing innovative changes to a United Methodist college that he was told had been a well-kept secret too long. Last fall, Virginia Wesleyan added master’s degree programs in education and business administration, started an online division, welcomed the inaugural class of 40 students to the Batten Honors College and completed its transition to university status. VWU also has launched a rebranding effort — those surfboards in the administration building point to more than fun in the ocean. “We’re not just celebrating that we’re in Virginia Beach in a beach community, but we’re celebrating the value-addeds that come with being in this location,” Miller says. VWU’s location on the Norfolk city line also offers students opportunities at a range of Hampton Roads sites — from internships at the Port of Virginia to glass-blowing classes at the Chrysler Museum of Art — plus a coastal environment to study. Students use a 45-foot research vessel, co-owned with the Virginia Aquarium & Marine Science Center, to gather specimens for experiments at the 44,000-square-foot Greer Environmental Sciences Center, which opened last fall. Financed entirely by an anonymous donor, the center quickly drew accolades, including the Chesapeake Bay Foundation’s Conservationist of the Year award. The facility, which won LEED Gold Certification from the U.S. Green Building Council, is clad with reclaimed sinker cypress, has a green roof and is surrounded by native plantings and habitats. A turtle already has made a nest in the wetlands basin out back. But for students, the center is transformative, says Maynard Schaus, the university’s associate provost who is a biology professor. “It links what we’re doing in classes with the outside environment,” he says, with labs that allow for high levels of experimentation. 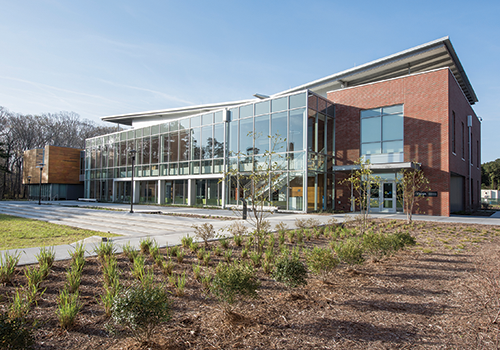 The building is one example of major upgrades to campus infrastructure outlined in a 10-year master plan. Ground has been broken for the 23,200-square-foot Susan S. Goode Fine and Performing Arts Center, which is scheduled to open next year. It will feature a $154,000 Steinway concert grand piano in a 300-seat theater. Across Wesleyan Drive, on a 12.8-acre tract of university property, VWU plans to break ground this summer on a 248-unit residential complex in partnership with a private developer. The complex will house some upper-level students in addition to faculty and staff from area schools. “Right now, with the exception of the founding of the institution in the 1960s, we’re going through the most aggressive construction period in the history of the institution,” Miller says. He plans to grow the university’s enrollment also. VWU currently has about 1,500 students. Miller would like to see the headcount climb to 1,700 students in about five years. The online program, which started modestly with 62 students, is expected to increase to 300-500 students through increased offerings during that five-year period. The MBA program also is taught entirely online, but the master’s in art education is offered exclusively in the classroom, “what we call seat time,” Miller says. 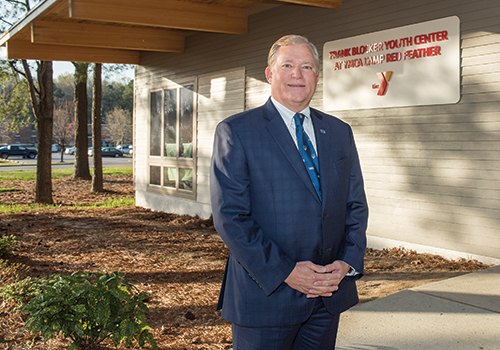 VWU’s Frank Blocker Youth Center is a laboratory for teacher education as well as a collaboration with the YMCA’s summer camp program and Tidewater Collegiate Academy, which serves homeschool families. Miller also plans to expand the number of students admitted to the Batten Honors College by 40 a year to a total of 160 over four years. For this year’s class, the program provided full-tuition scholarships to 20 students and two-thirds scholarships for another 20. Miller is sensitive to the school’s tuition costs, which have risen about 3 percent a year during the past 15 years. The university has announced it will not increase tuition for the next academic year. “When a student leaves here, I asked them why, and cost has become the single-biggest reason why a student doesn’t continue,” he says. With the help of a donor, VWU held a program last summer that let students “who might be on the margin” work off a portion of their bill. For the spring semester, the university also brought two students from storm-ravaged Puerto Rico to study at VWU, a move that “we saw as part of our mission as a United Methodist institution,” Miller says. Steven Emmanuel, a philosophy professor, has witnessed the school’s trajectory. He arrived in 1992 at the same time as Miller’s predecessor, William T. Greer, who initiated overdue construction projects and inspired more from the faculty. The changes were necessary for VWU to flourish and make “it possible for us to continue to invest in keeping our strong, core liberal arts focus,” the professor says. That includes student access to faculty in ways that are unlikely at larger institutions. “Even though we’ve moved to university status, we’re still a small school,” Emmanuel says.